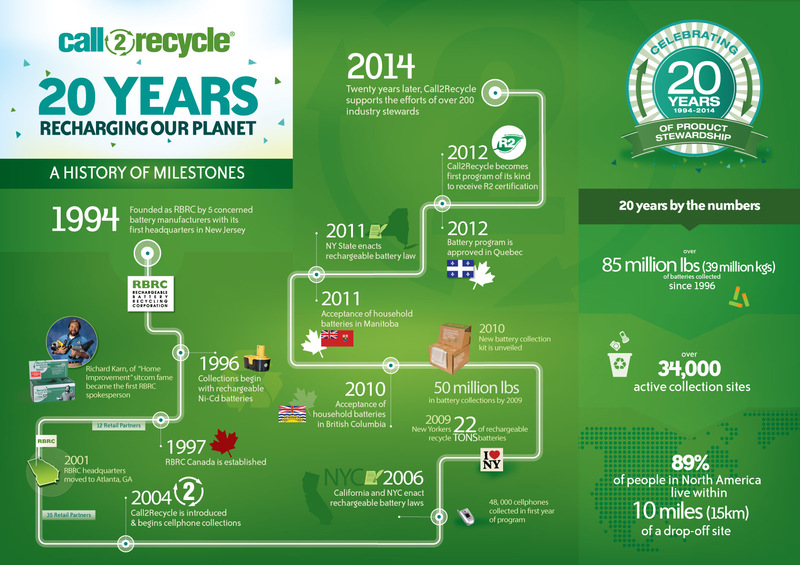 The non-profit organization that operates the Call2Recycle® program is officially changed from Rechargeable Battery Recycling Corporation (RBRC) to Call2Recycle, Inc.
Call2Recycle expands its program to include all household batteries, including alkalines, in Canada’s Quebec province. Call2Recycle announces in April the election of John Matthews, principal of Matthews Strategic Services, LLC, to the RBRC Board of Directors. Call2Recycle is awarded a Bronze Telly for its “Answer the Call” Public Service Announcement (PSA). Call2Recycle announces in January the election of John Bradford, Chief Innovations Officer for Interface Americas to the RBRC Board of Directors. Call2Recycle received a special permit from U.S. Department of Transportation for its all new collection box. Call2Recycle expanded its program to include all household batteries, including alkalines, in Canada’s British Columbia province. Call2Recycle launched MyCall2Recycle, a consumer awareness campaign that challenged Americans to recycle one million pounds of batteries. Call2Recycle is the first battery program to be recognized by Basel Action Network for ensuring that battery waste is not dumped overseas. Linda Biagioni, the vice president of environmental affairs for Black & Decker, is elected to the board of directors. Call2Recycle expands its rechargeable battery collection program to include 5th chemistry, Nickel Zinc (Ni-Zn). Call2Recycle partners with U.S. Forest Service and with Earth911. RBRC Canada celebrates its 10th anniversary. The House of Representatives reads and adopts Georgia House Resolution 87, which commends RBRC as one of Georgia’s sustainable businesses. Call2Recycle receives Zephyr Award for 2005 Annual Report. Popular Science magazine presents “Ad of the Month” award to RBRC for “Recycling That’s Easy to Wrap Around” advertisement. Call2Recycle receives SABRE Award of Excellence for the 2005 Fashion Week event. Call2Recycle waives program fees for all U.S. and Canada businesses. RBRC announces new national program, Call2Recycle®, for recycling old cellphones, as well as used rechargeable batteries. RBRC waives program fees for public agency participation. RBRC’s public education campaign generates 400 million media impressions. RBRC Canada receives a Certificate of Appreciation from Mayor of Ottawa for the Take It Back program. Popular Science magazine honors RBRC with “Ad of the Month” for the woodpecker with power drill print ad. The Home Depot names RBRC, “Environmental Partner of the Year”. RBRC receives Waste Minimization Award from the Recycling Council of Ontario. America Recycles Day presents RBRC with Certificate of Appreciation. Program expands to include all small rechargeable batteries, adding Ni-MH, Li-ion, and Pb, along with Ni-Cd. RBRC receives Pollution Prevention Award presented by the Canadian Council of Ministers of the Environment. RBRC is included into Canada’ EcoAction 2000 network. Renew America and the National Awards Council for the Environment Sustainability presents RBRC with a Certificate of Environmental Achievement. RBRC receives Recycling at Work Award from the U.S. Conference of Mayors. Keep America Beautiful presents a national award to RBRC. RBRC’ Charge Up to Recycle! program launches in the U.S. featuring Richard Karn, ‘Al’ from TV’s “Home Improvement”. The rechargeable power industry funds RBRC to provide collection and recycling of Nickel Cadmium (Ni-Cd) batteries.